This year will see British baby boutique Mamas & Papas expand, by developing and enhancing its e-commerce offering. The brand aims to increase the number of goods it sells via parcel delivery service by improving its online presence. And although the brand doesn’t sell fashion items, like petite maxi dresses, the company will endeavor to push its baby products more in the upcoming year. 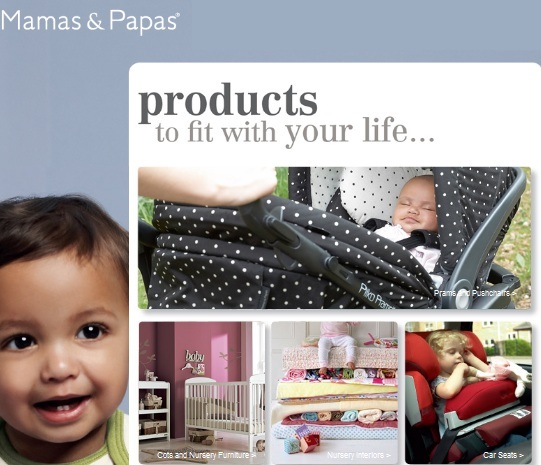 Mamas & Papas will team up with e-commerce specialists, One iota, to develop strategies to help enhance the brand’s availability to customers. They are aiming to do this by improving the online offering and shopping methods, as well as spreading the word about the brand via the internet. This is most likely due to the fact that a strong, interactive online presence is no longer optional for successful brands. The online focus is part of a broader plan to enhance multichannel retail, which has become more and more popular. This will also result in the company equipping each of its stores with WiFi, and all of its products with QR codes. This will allow shoppers to use their smartphones to gather as much information as possible about the products on offer, all without leaving the shop. To make this approach work, One iota plans to optimize and tailor the Mamas & Papas mobile site. These optimizations will include giving customers the opportunity to order goods for courier delivery, easily and efficiently. It will also aim to simplify navigation so that you can find what you want – easily and quickly. There are already plans for a tablet-optimized site and a new social media strategy – all to enable the brand to become more connected to its customers and fan base. E-commerce director at Mamas & Papas, Rob Jennings, has said that technology is a key part of the company’s future plans. He highlighted statistics which show that 20% of people who visit the company’s website, do so via a mobile channel. When one considers the massive popularity of smartphones in modern Britain, it’s easy to understand why brands are placing so much emphasis on mobile technology. Jennings went on to say that it’s especially relevant “to our industry in which busy parents increasingly want their digital experience on the go through devices that are suited around their lifestyle.” The brand started off as a small west Yorkshire company, but has since boomed to become a global brand with shops in 34 countries. Our shop has many kinds of buy cheap brand handbags , if you like this ,contact us , we service for you online every hour!